Enjoy Scenic Views of Manuel Antonio from High Above the Ground! Can you imagine soaring parasailing Manuel Antonio, 600 feet above the Pacific Ocean and floating over the bright green treetops that wash away into emerald waters? 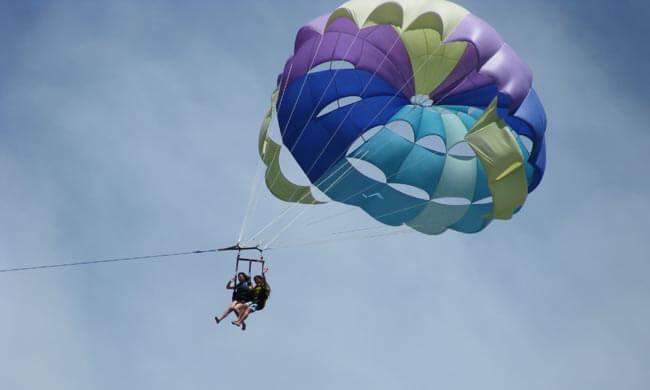 You’ll be able to see Manuel Antonio in all its glory from this unforgettable angle: you are going parasailing! Harness up after your safety lesson and get ready for flight! Grab a friend or go alone. One, two, three…right from the beach, you take a few steps and now you’re soaring through the air! Enjoy a 25-minute run with spectacular views. To get back down, you’ll slowly be lowered until you make a soft landing right into the water. After your time parasailing is over, you may choose to stay and enjoy the beach and return to the hotel on your own later. Enjoy complimentary use of their boogie boards if you do stay on the sand. Your tour includes: Transportation to/from your hotel, safety lesson, insurance, equipment, bilingual guide. What to bring: Camera, sunscreen, insect repellent, change of clothes (if preferred), towel, (polarized) sunglasses. Wear a swimsuit and sandals (or water shoes).